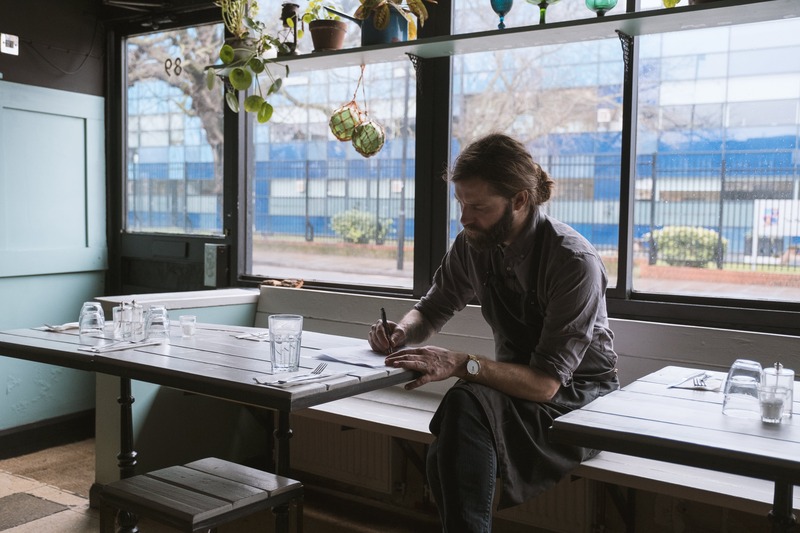 Tucked away on a corner of Shacklewell Lane in Dalston, a shabby turning chic district in north east London, the former fashion model Konrad Lindholm runs a contemporary brasserie featuring modern European dishes using the finest local, seasonal and ethically-sourced organic produce. It’s the kind of hangout, stuffed with chintzy curios and wooden tables, which manages to be a definite winner with the locals, as well as, catch the attention of a wider audience of discernible foodies. We met up with Konrad for a lively experimental session in his kitchen. Inside this cool Swede there’s definitely a hot passion for food. I’m originally from the north of Sweden but moved to England as soon as I graduated from culinary college. I soon started to work at an upscale restaurant and cooked for the likes of Tony Blair, David and Victoria Beckham among others. I learned a lot but found the atmosphere in the kitchen really hard. There was a lot of bullying going on, intense pressure, crazy working hours and a boss who would make Gordon Ramsey look tame. I decided to move on after having a hot frying pan thrown at me. I ducked and walked out of the kitchen. I moved to London, got dragged into modelling by my girlfriend (who was a model at the time), worked at Tower Records and as a DJ in various night clubs. But I couldn’t let go of food entirely. I started working part-time as a chef at a gastropub with an organic philosophy at heart and found my way back into serious cooking. Eventually, I had saved enough money to start up Floyd’s. In three words it would have to be - try new things. At Floyd’s we have an ever-changing menu and I’ve made it a habit of mine to continuously experiment with food and flavours. I think it’s important to let go of recipes since it will only limit your imagination. Of course, sometimes it can go terribly wrong but from time to time you stumble upon something really special. I guess I’ve now come to a point where I know whether it’ll work or not even before I try it. You start to understand the underlying chemistry and how different ingredients react to heat in different forms and how flavours react with each other. Fusion cooking is all about balancing flavours and textures. What was your approach using Snøfrisk®? 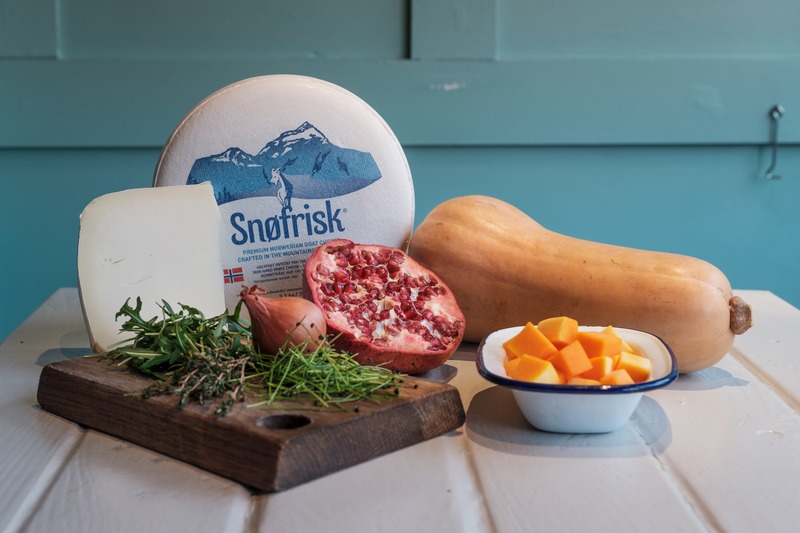 Balancing flavours is something I do every day and Snøfrisk® is surprisingly mild and pleasant to work with. I sometimes find goat cheese so intense it makes it hard for other ingredients to compete, but in this case the cheese doesn’t take over the dish but rather complements it really well. In addition, it melts nicely, but not too fast, which means you can grill the cheese without it turning soggy. From the age of 13, my mother made me cook dinner once a week for the whole family. I guess that’s where my love of cooking started. I can still remember the fresh ingredients, salmon, herring, potatoes, dill. It makes me a bit nostalgic just thinking about it. Trying out new things have always excited me. I find traveling to be a really great inspiration. Whenever I go on a trip, I always come back with a completely new menu in my head. Sniffing up good quality ingredients work in pretty much the same way. They make your mind travel and help you dream up new and exciting flavours. How do you tell if an ingredient is good quality? It is quite simple really. It’s all about where they are from and if they’re in season. I would recommend to follow the seasons as much as possible and to work with good local producers that you trust. I don’t get why you would fly in ingredients from the other side of the world when there’s a world to discover on your home turf. It’s too expensive for my taste and obviously bad for the environment as well. Don’t. No, just kidding. But experiment when you have a little extra time by yourself. This will teach you what works and what doesn’t without the risk of having to serve your mishaps to your friends or family. Step by step, you’ll build up your confidence with the experience you gain. Thanks for meeting with us Konrad! You can visit Floyd’s in Dalston, London - or cook his five Snøfrisk® Fusion recipes here.